Neurology is a complex field in the already complex realm of professional medicine and diagnostics. Most of us are aware that neurology is the branch of medicine that essentially deals with the anatomy, functions and the disorders of the nervous system. Various nervous system disorders usually affect the brain, spinal cord and nerves. These nervous system disorders may lead to stroke, epilepsy, and movement disorders, among other medical conditions. Does getting a second opinion matter in this case? Neurologists are doctors who specialize in neurology, and all the complex workings of our amazing minds. They are trained specialists that investigate, diagnose and treat neurological disorders, such as nervous system disorders. The challenges a neurologist faces during diagnostic examination make it vital to get a second opinion for any neurological disorder. The findings of neurologists about a patient’s condition may not always be 100 percent correct every time. An article published by John’s Hopkins Medicine notes that diagnosing nervous system damage is complicated and complex. The article also stated that nervous system disorders do not have solid causes, markers or even tests. Neurologists must advise their patient to seek a second opinion, as the opinion may prove to be a lifesaver. If you are not comfortable, or your neurologist is not confident about the diagnosis, a second opinion by specialists in neurology may help take doubts out of your diagnosis and treatment. Talk to a doctor online now about your doubts, and ask online questions about your specific treatment worries. Expert opinions are not always accessible locally. This makes getting a second opinion online about nervous system disorders ideal. Nowadays, there are a number of well-known sites that provide second opinions after a careful review of an individual’s medical records and diagnostic tests. In fact, a study published in The American Journal of Medicine found that 40 percent of nearly 7,000-second opinions resulted in a change of diagnosis and/or treatment. 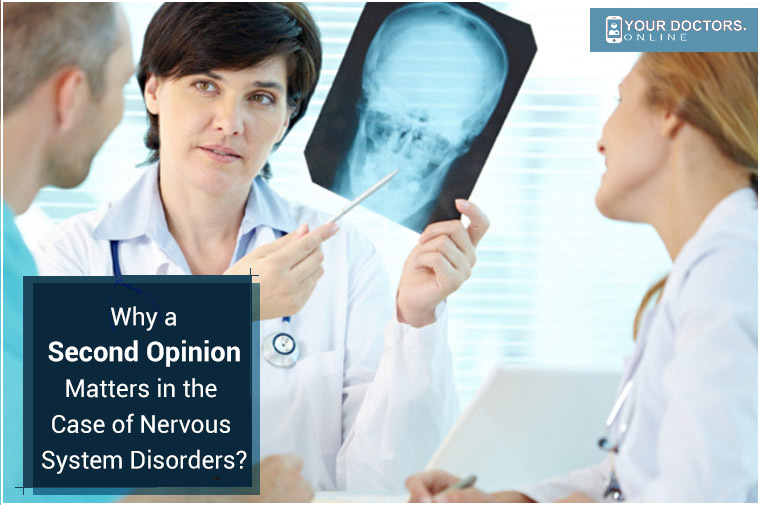 A second opinion is usually offered by a team of neurologists who have greater experience in different types of neurological cases. Therefore using an online consultation service for your second opinion is definitely a worthwhile choice.